At PDC we understand that intelligent Line Control software is key to the efficiency of the whole plant. We make sure that all parts of the line work together to bring maximum productivity to each machine. Being machine specialists enables us to create a seamless flow through all machines within the line. We can provide complete Conveyor and Line Control systems that will integrate flawlessly with your machines and services. We understand the need to use modern techniques, our line control systems do not just start and stop. Cans flow perfectly to machines with minimum popups on corners and we balance the entire line to greatly improve efficiency. 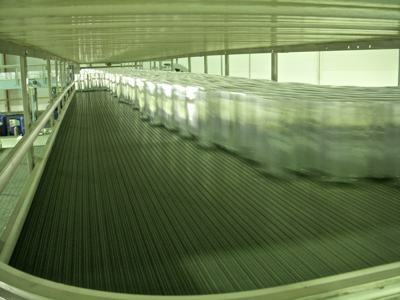 We have recently tested our new intelligent Energy Saving modes, which can cut energy used by empty conveyors by 20%. Full manual controls if required. Metering conveyors to reduce stop starting. Intelligent corner control, zero popups. Siemens or Allen Bradley control systems available.